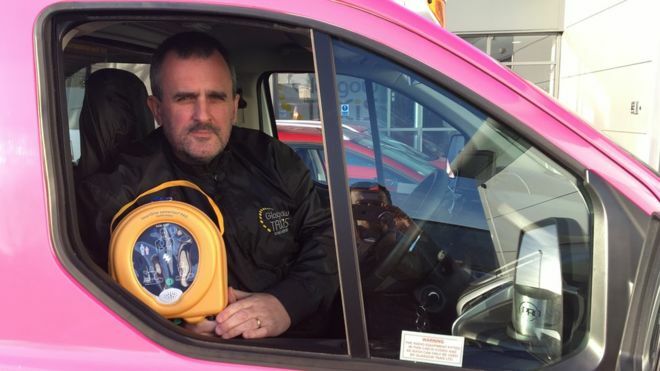 Cardiac arrest defibrillators have been installed in 15 of Glasgow’s taxis. Taxi firm, Glasgow Taxis, has taken on the lifesaving initiative with a new medical trial. The trial is the first of its kind to be rolled out in Scotland and will see drivers equipped with the life-saving devices during their shift around the city. The drivers will be fully trained to use them in the event of emergencies and Glasgow Taxis has already put in place a first aid training policy with the aim to highlight their community commitment. Stephen Lally, one of the defibrillator-trained drivers, has previously suffered heart problems himself. He said: “I was thinking about it when we got our training, quite often when we pick people up on a dark night and in the rain, they’ll say to us: ‘Driver, you’re a lifesaver’. Well, this phrase can take on a whole new meaning now. The taxi firm plans to install even more defibrillators should the initiative prove a success. Chairman of Glasgow Taxis Ltd, Stephen Flynn, said: “We don’t just drive taxis and take people from A to B. We’re committed to giving back whether that’s through charitable support, fundraising events or this latest initiative. “By introducing 15 potentially life-saving defibrillators to our taxis we’re utilising the very natural willingness of our drivers to help people. With a test of the benefits of having these machines available in our vehicles. David McColgan, of British Heart Foundation Scotland, said: “A cardiac arrest is the ultimate medical emergency and every minute without CPR reduces a person’s chance of survival. “Alongside administrating CPR, the early use of a defibrillator is a key link in the chain of survival.